CVS FERRARI offers a complete range of dedicated Empty Container Handling Lift Trucks. In the CVS FERRARI format this mature product concept has been expanded offering high capacities and lifting heights coupled with high lifting speeds and unprecedented safety. The ECH range includes 6, 7 and 8 high 8’6″ container stacking ability models with a single box side pick spreader and up to “2 over 7” model with a Double Stack spreader. The high intrinsic longitudinal and lateral stability of the machines is the first safety feature of the trucks. CVS FERRARI compliments this by equipping every model with a standard Load-Moment-Indicator/Limiter. This precise device senses/limits the load moment, monitoring the weight, size and lift height of each move by automatically restricting the drive, tilt and lift. This unique device that only CVS FERRARI provides on this type of machinery, is just one of the several features of the on-board computer system with which these machines are equipped. High or low mounted and even a hydraulic tilting cab option are available to suit every drivers habit or visibility requirement. Sisters of the Empty Container Handling Reach Stackers the CVS FERRARI “masted” empty handlers fit the same key components of the boom type empty container machines. This accomplishes great parts standardisation for the mixed fleet customers as well as for the supporting service network. 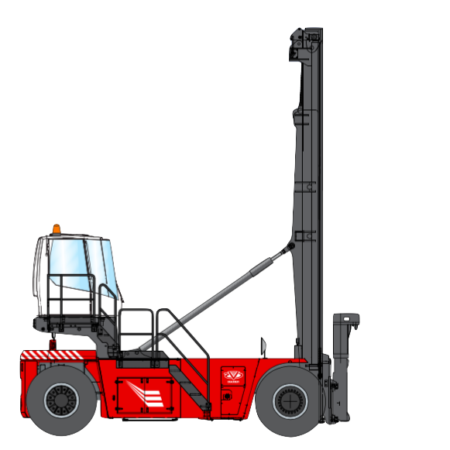 The CVS FERRARI Reach Stacker family is completed with a range of machines dedicated to empty container handling. They are a favourite solution for many empty container terminal operators. Working in demanding applications where doorways and overhead wires must be negotiated, the empty reach stacker becomes an invaluable tool in your fleet. With the ability to unload second rail from one side reaching over a first rail line saves travel time, tire wear and extra property development. Its ability to be selective in the stack saves many moves in the course of a day. Boasting the highest capacity in the industry the ERS provides a massive 12 ton lift capacity in the first row that enhances the applications this machine can work out. CVS FERARRIS is also the sole ECH Reach Stackers capable of side pick and even double stack of empty 20′ and 40′ containers. Hydraulic powered pile slope is available on top and side pick attachments. The CVS FERRARI Empty Container Handling Reach Stackers use the same quality hydraulic and electronic components used on the larger size Reach Stacker ranges, such that their reliability, speed of response and economy of run lives up to the fame of their larger family members. The full range of Reach Stackers come standard with manually sliding cab providing ease of access to the engine and transmission compartments of maintenance and all the CVS FERRARI Reach Stackers come with a very useful service bay that enables the change of filters and lubricants from a comfortable standing position.